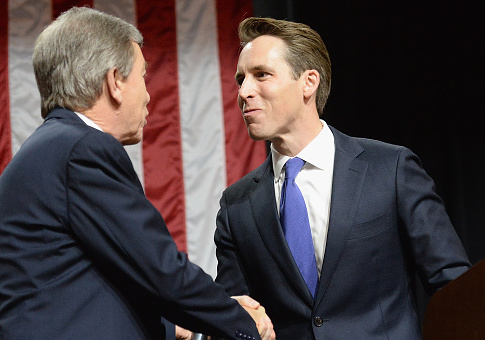 Both a national Democratic committee and a David Brock-run liberal super PAC were digging for dirt on the wife of Missouri Republican Josh Hawley months before he even announced his campaign, according to freedom of information requests obtained by the Washington Free Beacon. Inquiries for records on Erin Hawley were sent by both the Democratic Senatorial Campaign Committee and American Bridge 21st Century, a liberal opposition research PAC that raised millions from liberal donors to attack Republican candidates in 2018. Both groups sent their requests to the University of Missouri, where she is a law professor. The DSCC's July request asked for all messages sent or received on Hawley's university email address since her initial hiring in 2011, all materials she has produced for the university, and the syllabi for any of the courses she taught. A month later in August, operatives from American Bridge sent two requests to the university—the first asking for the "offer letter submitted" to Hawley in 2011 and the second asking for "copies of travel or reimbursement forms" involving Hawley since her hiring. The requests from both groups came months before Josh Hawley announced his campaign in October. Neither group responded to questions about the requests or whether they regularly look into candidates' spouses. The campaign for Hawley's Democratic opponent, Sen. Claire McCaskill (D., Mo. ), didn't respond to questions on whether it was aware of the inquiries into Hawley's wife. "American Bridge will make running as a Republican candidate in the next four years painful," the group wrote in private and confidential documents obtained by the Washington Free Beacon in January 2017. "We will not only damage Trump, but also the candidates who enable and support him." "Republicans running in 2018 will be plagued by what we are best known for: opposition research, video tracking, and rapid response," it wrote. "We will be involved in every competitive race in 2018." The group refers to itself as "the Democratic epicenter of opposition research and rapid response in presidential and Senate elections." It boasts "18,000+ stories placed based on Bridge research since 2011." It doesn't appear any of the requests on Erin Hawley have resulted in news stories. The Washington Free Beacon has retained third party firms to conduct opposition research since it was founded in 2012. "Game respect game," said Free Beacon editor in chief Matthew Continetti when he was told of liberal research efforts in Missouri. This entry was posted in Politics and tagged 2018 Election, David Brock, Josh Hawley. Bookmark the permalink.